"One thing you have to understand about our ministry here in Utah is that we love Mormons." That was how OP pastor Jason Wallace explained to me the unique, ongoing outreach effort of Christ Presbyterian Church in Salt Lake City. "Many of the fundamentalist churches in the valley hate the Mormons. They will often go to Temple Square and publicly rail against them, even sometimes trespassing on their property and defacing things Mormons hold dear. But we see ourselves as being here to reach Mormons with the gospel of Jesus Christ. Our Reformed commitment to sovereign grace means that God can and often does bring these misled people out of darkness and into his marvelous light." Utah is a graveyard of evangelical gimmicks. 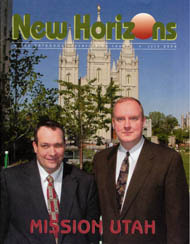 Nearly every conceivable attempt has been made to reach Mormons with the gospel, but no large inroad has ever been made. Meanwhile, the Church of Jesus Christ of Latter-day Saints has over 60,000 missionaries in 165 countries and grows by over 300,000 members each year. A recent Southern Baptist study estimates that they lose 282 members per week to the Mormons.